This is not a post about whisky... again. Recently, thanks to the handy work of our now remote member, The Converted, and The Trish Nicol Agency we received some Endeavour True Vintage Beer samples. Not to be a hog and with only 2 x2 samples to try I passed over some samples to fellow member El Capitan to deliver his interpretations as well. Endeavour True Vintage Beer is a small independent Australian brewer started in 2007 and located in (form all appearances) in or around Sydney NSW. According to the website these 3 chaps do not as yet have a brewery of their own and rely on the facilities of another anonymous helpful brewer. 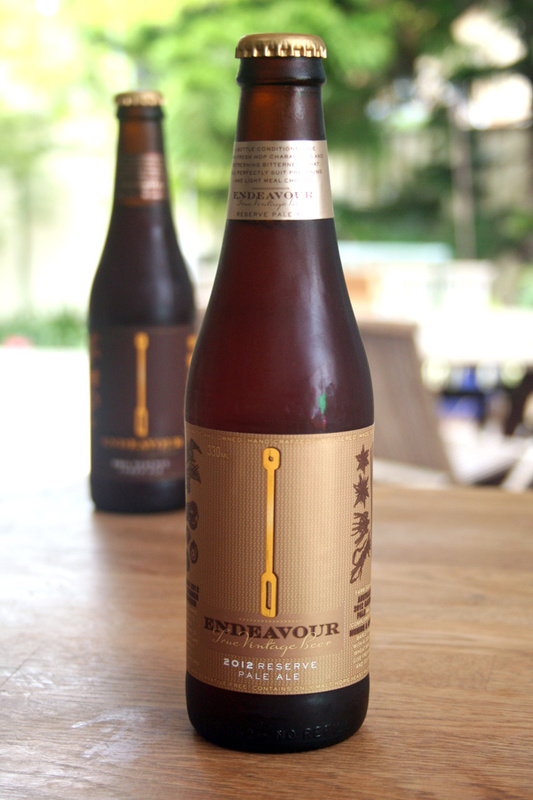 Endeavour True Vintage Beer boasts 2 'hand crafted' yearly expressions being a Reserve Amber Ale and Reserve Pale Ale. Though completely conjectural and judging from the pictures I suspect the brewing is currently done at the Australian Brewery at Rouse Hill NSW just outside of Sydney, something about the vats, light and corrugated iron walls (don't quote me on that it is just a guess but maybe they can enlighten us?). Hops: Galaxy, Summer and Southern Sazz hops. So let us get on with our interpretations. Firstly let's look at El Capitan's views and then The Baron's. Colour : Very dark brown and hardly translucent. Little light penetrates through. A bit mud like or could even be stew. Nose: A very yeasty beer, with a strong malty presence. Vegemite notes are very clear to me. It's very inviting and quite intriguing almost. Taste: A thick and chewy beer with a lot of earthy characteristics. I think this is a very complex beer. You can really think about the flavours you are tasting. Those hints of vegemite are present along with a hint of bitterness. 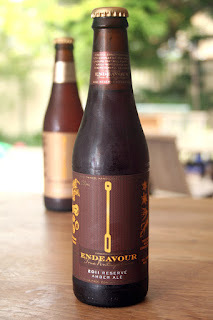 Overall: I found this an extremely unique beer that I haven't tried the like before. It was very enjoyable and well worth going out of your way to try. 6 out of 7 lightning bolts. Colour: It's quite a dark rich, deep amber. Reminds me of manakau honey or burnt caramel as well. Nose: Light, fruity sweetness with a huge lychee hit. Nice. There's big malty notes as well. It's smells invigorating and is very inviting. Taste: Quite hoppy, full body Pale Ale. Quite a heavy beer with strong malty flavours. A lot of similarties to a wheat beer for me. Overall: This is the sort of beer I like to consume over a long period. A good one for chewing the fat with some old mates. It's quite heavy for my palette but still retains some interesting characteristics. 5 out of 7 lightning bolts for me. Colour: A deep rich amber, you know this one has some booty. On pouring I see a corona of green coming off the amber tainted thick foam indicating to me that the hops are going to be all over the flavour profile. Extremely fine and fast beading continues to rise all the way to the bottom of the glass. Nose: Chocolate malts in the forefront and sweet fresh cut wheat's in the background showing some real complexity. I really enjoyed nosing this exotic baby. Taste: Again sweet malts enriching the pallet followed by even bitters and green cut hops in the rear. Flavour remains crisp throughout but I find the sweetness a little intense on its own. Overall: The sweet malts become pallet overpowering after the 4th or so mouthful. I found, like many of these heavier Ales food is a constant and welcome companion. My choice was to go with a sharp cheddar to restore the pallet and added the needed balance but it would certain entertain something heavier like a hearty steak. Though bottle conditioned there was no cloud and no residue in the bottle or around the cap suggesting conditioning is coming primarily from the vat. It also shows a great consideration has been taken to ensure a settled bottling process. I give it a 5 1/2 out of 7. Good for one or two prior or during a meal but might be a little intense every day. It is somethignspecial and should be taken for the quality not the quantity. A x4 pack at $14.99 at Dan Murphys is a great option and I like the introduction into the market in these smaller selections over recent years. Colour: Golden hues with a medium cloud. On pouring the beading was much larger than the Pale Ale but continued to the end of the glass. I found residue yeast in and around the cap seal. Though residue on the inner cap is fine the yeast along the seal may have compromised this beer in the future. Nose: Light mild citrus's and snapped passion fruit vines but little else of note. Taste: A little dry across the pallet and hops bitterness all in the forefront with mild passion fruit sweetness in the back. Spicy across the pallet overall. Very crisp but too drying for my likes. Overall: I found this too pallet aggressive, especially in the dryness. I just did not find the love in this ale at all. Before completing a word on bottled conditioning. For those not in the know effectively bottle conditioning is about ensuring yeasts and sugars are unfiltered and remain in the bottling process and or added in addition to the bottles in filling. By ensuring the yeast's and sugars remain ensure the beer continues to develop over time and under good conditions will deliver extended years of shelf life with developing flavours. If you love these kinds of beers put some away in a dark cool environment and see what develops. Preferably if you do not have a cellar or cold dark room, find somewhere under the house and dig a hole, maybe line the whole with some bricks and pop a cover over the top. It is all about cool temps and no light what so ever for development (just be suspicious if you hear some clinking on occasion and whispers of "my precious"). These beers have neither been given the 'crafty wash' or gimmick marketing ploys to sell the beer and I think that is great! 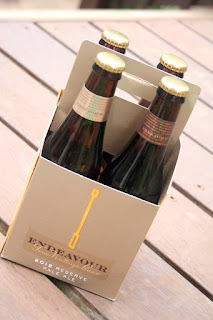 There is just too many 'crafty' beers in the Aussie market now and when we are outlaying anything up to $22 for a 6 pack for pure rubbish it is refreshing to find something good, reliable, and clearly 'crafted' for the love of it. Thanks Endevour we will come again.